This week’s chapter of the Injustice: Gods Among Us digital comic focuses on the Flash as he struggles with the consequences of Superman and Wonder Woman’s campaign and his role in it. Some disclosure: I haven’t been reading this series, so I came into this issue relatively fresh. All I really know is it’s supposed to set up the world of the video game, and early issues feature some really unpleasant stuff with Lois Lane and Superman. It’s an intriguing character study. 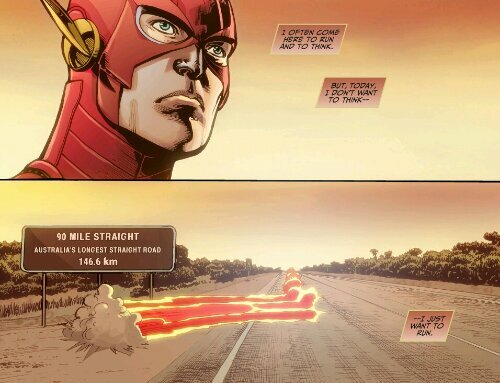 The Flash tries to clear his head with a long-distance desert run, but fails, dwelling on the events of the day and what he learned afterward. The most poignant moment occurs when he finds the remains of a kangaroo hit by a truck. The driver, he muses, didn’t have time to react and had no hope of stopping it. The Fastest Man Alive, however? He watched the incident in all its sickening detail, fully aware of what was happening and fully able to stop it. Only he didn’t. The comic does a good job establishing what’s going on and who’s involved, as well as showing Barry’s realization that he’s signed on for something horrible. What’s not clear is why he sided with them in the first place, given the way he’s portrayed in this issue. Is it that he trusts Clark and Diana? That he believed in their cause, but didn’t understand what they were doing? Did it start out benign and escalate? To be fair, the target reader has probably been reading since the beginning and doesn’t need to be reminded in such a short chapter. It does feel a bit familiar: Superman and Wonder Woman taking over and Batman trying to stop them reminds me a lot of Kingdom Come or the Squadron Supreme Utopia Project. That said, it’s been more than 15 years since Kingdom Come and almost 30 since the Squadron Supreme story, so it’s hard to begrudge a newer take on the same thematic elements. I continue to be impressed with how much story DC’s digital first comics fit into essentially a third of a standard comic, and even though the overall story doesn’t grip me from this one installment, the Flash’s story does. This entry was posted in Reviews and tagged Barry Allen, Injustice: Gods Among Us on April 10, 2013 by Kelson. The suit looks better here than it does in the game actually, LOL. I’ve only been looking at the scans they put out on Scans-Daily (and if someone knows of another site that posts scans like that I’d love to know the address because their selection preferences are…not always my cup of tea.) Anyway, got the impression it was like the toad in the pan of heating water: started off looking like a reasonable amount of heat given what Joker did, but then…eh, the path to Hell is paved with good intentions? Absolute power started to skew their sense of ethics… Think Justice Lords in JL: DCAU’s A Better World. I do hope Barry goes back to being a good guy in the game and utterly redeems himself. Bad enough seeing my second fave superhero go power insane. Aw, crud. I was half hoping that that armored look on Flash was something recent on him…adopted since joining with Supes in policing the world. However a Google Image Search of “Injustice 13” revealed a scan of current armored Flash looking at what had to be a picture of himself about five years previous…same awful getup. Dang. The kangaroo moment sounds very Dr. Manhattan. Yeah, I hate all the armor and pouches and compartments and lines and collars EVERYONE’s suit has to have lately. I don’t get it, and The Flash, while maybe armor wouldn’t “slow” him down, certainly LOOKS like it would, he’s supposed to be all about being streamlined and sleek and speed. Doesn’t need armor, it’s out of place for him, and neither does SUPERMAN for that matter. Unless Superman’s is anti-kryptonite and Flash’s has a nulling field for gravity-enhancing weapons? It really does make him look like pre-DC52 Cyborg’s brother. I disagree when it comes to not needing armor for speedsters. They aren’t invulnerable. If they get hit moving at the speeds they are moving it is going to hurt not to mention random debris, rocks, etc. Yes, there is the Speed Force and Barry’s vibrational abilities but still. I do agree that THIS design probably wasn’t the best when it comes to armor, although I do dig it. I’m probably going to be using the New 52 skin in the game anyway. I disagree, I think armor is always stupid for The Flash. What “armor” could possibly protect him for speeds he runs anyway? I always aw the uniform as a means to hide his identity and cover him, his aura protects him for the most part when he runs. Armor is a stupid idea for The Flash. What rocks and debris can even touch touch The Flash at the speeds he moves anyway? I do like the New 52 suit out of all the redesigns best though. Do all the heros go power insane? Havent really read anything Injustice related. If they do I am sure its got a twist..like some influence caused it. Power insane or the result of an intense fear and anger about how evil was able to twist a knife into good’s gut? Only it went way overboard from seeking justice to seeing by any means necessary that evil never happened again….even if the next evil was their own actions? Just guessing, mind. I only view the odd amount of presented scans. Honestly? Can’t totally fault Superman for loosing a screw or two given what happened. I’d have picked up the nearest gardening tool and had at the Joker until physically stopped. Great review. I’ve been seriously thinking about getting Injustice. I’m not sure if I should get it on my iPad or wait for a trade paperback. Does anyone know if it is a limited series or an ongoing series? If it’s a limited series, how many installments the digital version will have?